Orrin Abner Abbey was born April 22, 1846, in Clarke Twp., Newcastle Dist., Durham Co., Canada West, and died October 4, 1905, in Artesia, Eddy Co., NM, at age 59. Buried in Woodbine Cemetery, Artesia, Eddy Co., NM. He is the son of Nathaniel Abner Abbey of Dutchess County, Province of New York, and Mary Louisa "Polly" Nugent of County Cavan, Ireland. Buried in Woodbine Cemetery, 210 E. Hermosa Drive, Artesia, Eddy Co., NM. 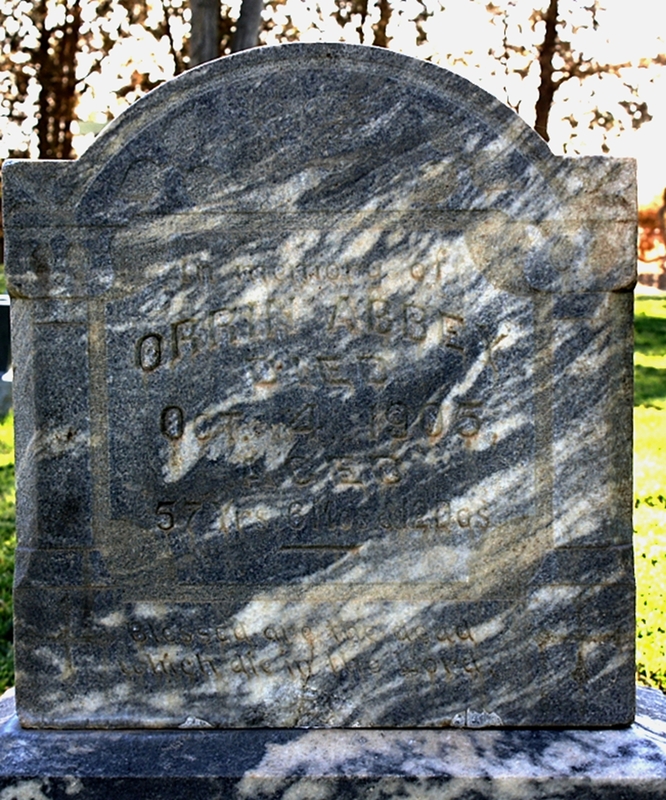 Alternate birth date based upon gravestone information: March 22, 1848. Adella T. "Delle" Corey was born about 1845 in Randolph Twp., Crawford Co., PA, and died November 20, 1892, in San Diego, San Diego Co., CA, at age 47. Buried in La Vista Memorial Park, National City, San Diego Co., CA. She is the daughter of Enos Corey of Meadville, Crawford Co., PA, and Electa Wilcox of New York. Enos Corey died March 17, 1887, in San Diego, San Diego Co., CA. Orrin Abner Abbey and Adella "Delle" Corey were married February 22, 1872, in Kekoskee, Dodge Co., WI. Mary Unknown: Born about 1877 in Wisconsin; Died 1885 - 1892 in Republic Co., KS. She is the daughter of Unknown. Eunice Adella Davies: Born June 21, 1879, in Nebraska; Adopted 1880 in Sutton, Clay Co., NE; Died May 1, 1955, in Solana Beach, San Diego Co., CA (age 75). Buried in Oak Hill Memorial Park, Escondido, San Diego Co., CA. She is the daughter of Eben Davies of Wisconsin, and Chloe Elizabeth Butterfield of Illinois. Married April 3, 1912, in Los Angeles Co., CA, to Spencer Ward: Born October 1, 1880, in New Home Twp., Bates Co., MO; Died October 11, 1960, in San Diego Co., CA (age 80). Adella "Delle" (Corey) Abbey died November 20, 1892, in San Diego, San Diego Co., CA. After Adella "Delle" (Corey) Abbey died, Orrin Abner Abbey married a widow, Margaret Anne "Maggie" (Kneale) Garrett. Margaret Anne "Maggie" Kneale was born February 12, 1857, in Kirk Andreas, Isle of Man, and died February 10, 1947, in San Diego, San Diego Co., CA, at age 89. Buried in Greenwood Memorial Park, San Diego, San Diego Co., CA. She is the daughter of Thomas Kneale of Andreas, Isle of Man, and Jane Cleator of Andreas, Isle of Man. William Thomas Garrett was born January, 1857, in Kirk Andreas, Isle of Man; was Christened January 27, 1857, in Kirk Andreas, Isle of Man; Died June, 1891, in Kirk Andreas, Isle of Man; and was Buried June 28, 1891, in Kirk Andreas, Isle of Man, at age 34. He is the son of William Cavett Garrett (born about 1829) in Kirk Andreas, Isle of Man, and Mary Lawson (died before 1861). William Thomas Garrett and Margaret Anne "Maggie" Kneale were married June 2, 1887, in Lezayre, Isle of Man. Frederick Kneale Garrett: Born April 4, 1888, in the Town of Ramsey, Isle of Man; Died August 8, 1956, in San Diego, San Diego Co., CA (age 68). Married (1) 1910 - 1912 to Inez Angela Sexton: Born April 6, 1891, in Oregon City, Clackamas Co., OR; Died May 23, 1974, in West Sacramento, Yolo Co., CA (age 83). Divorced May 20, 1916, in San Diego, San Diego Co., CA. Married (2) May 17, 1920, in San Diego, San Diego Co., CA, to Edith Brainard: Born July 22, 1888, in Oakes City, Bear Creek Twp., Dickey Co., ND; Died July 5, 1976, in San Diego, San Diego Co., CA (age 87). William Thomas Garrett died June, 1891, in Kirk Andreas, Isle of Man, at age 34. Buried June 28, 1891, in Kirk Andreas, Isle of Man. After William Thomas Garrett died, Margaret Anne "Maggie" (Kneale) Garrett married a widower, Orrin Abner Abbey. Orrin Abner Abbey and Margaret Anne "Maggie" (Kneale) Garrett were married January 25, 1894, at the Central M. E. parsonage, San Diego, San Diego Co., CA. Mary Elizabeth Abbey: Born November 12, 1894, in Belleville, Freedom Twp., Republic Co., KS; Died January 20, 1992, in Portland, Multnomah Co., OR (age 97). Buried in Wilhelm's Portland Memorial, Portland, Multnomah Co., OR. Married (1) about July, 1912, in San Diego, San Diego Co., CA, to Frederick Strayer "Fred" Bunker: Born December 25, 1892, in Bellefontaine, Logan Co., OH; Died October 22, 1948, in San Diego Co., CA (age 55). Buried in Cypress View Mausoleum and Crematory, San Diego, San Diego Co., CA. Divorced. Married (2) about March, 1922, in Riverside Co., CA, to Sheldon Arthur Stubbs: Born December 6, 1886, in Tazewell Co, IL; Died June 14, 1960, in Portland, Multnomah Co., OR (age 73). Ethel Margaret Abbey: Born January 28, 1897, in Belleville, Freedom Twp., Republic Co., KS; Died May 18, 1945, in San Diego, San Diego Co., CA (age 47). Buried in Greenwood Memorial Park, San Diego, San Diego Co., CA. Married about 1917 in California to John Douglas Jacks: Born October 17, 1893, in Denver, CO; Died March 20, 1976, in San Diego, San Diego Co., CA (age 82). Buried in Greenwood Memorial Park, San Diego, San Diego Co., CA. Divorced about 1936 in San Diego, San Diego Co., CA. Lucille Myrtle Abbey: Born March 18, 1901, in Belleville, Freedom Twp., Republic Co., KS; Died December 30, 1961, in Los Angeles Co., CA (age 60). Married June 26, 1918, in San Diego, San Diego Co., CA, to Ralph Lee Henderson: Born August 28, 1898, in McCune, Osage Twp., Crawford Co., KS; Died October 31, 1955, in Los Angeles Co., CA (age 56). Adella "Delle" (Corey) Abbey is buried in buried in La Vista Memorial Park, National City, San Diego Co., CA. Thanks to Find-A-Grave for making this image available. Orrin Abner Abbey is buried in Woodbine Cemetery, Artesia, Eddy Co., NM. Thanks to Find-A-Grave for making this image available. 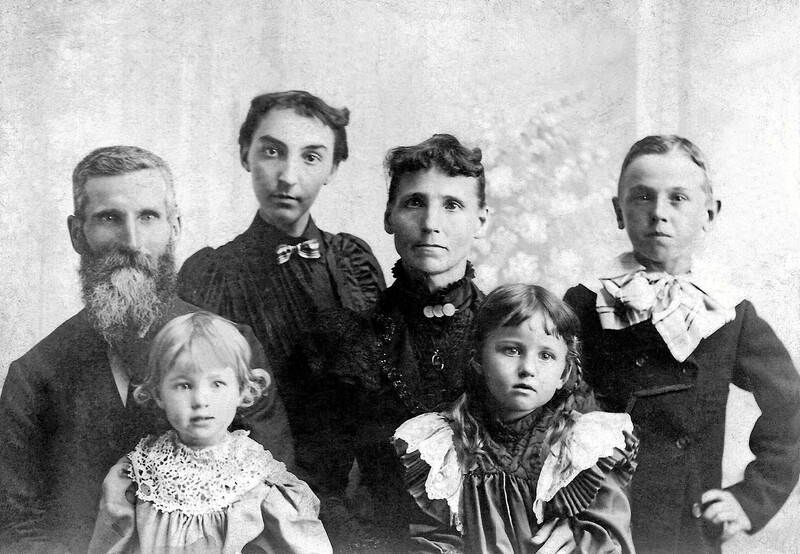 Top Row: Orrin Abner Abbey (age 53), Eunice Adella Davies/Abbey (age 21), Margaret Ann "Maggie" (Kneale) (Garrett) Abbey (age 43), Frederick Kneale "Fred" Garrett (age 12); Front Row: Ethel Margaret Abbey (age 3), and Mary Elizabeth Abbey (age 4). Picture taken about 1900 in Belleville, Republic Co., KS. Adella "Della" Corey was born about 1845 in Randolph Twp., Crawford Co., PA.
Orrin Abner Abbey was born April 22, 1846, in Clarke Twp., Newcastle Dist., Durham Co., Canada West. Nathaniel Abner Abbey, Orrin's father, died March, 1849, in Clarke Twp., Durham Co., Canada West, at about age 52. After the death of Orrin's father in 1849 in Canada, and the birth of Orrin's brother, Abner Nathaniel Abbey on August 9, 1849 in Port Hope, Hope Twp., Durham Co., Canada West, Orrin's mother, Mary (Nugent) Abbey, became a resident of Wisconsin, locating in Sheboygan Co. with her children, where she purchased a claim. For two years she made her home on the farm, then in 1851 his mother sold her interests and returned to Canada with all of her children except Wellington, where she spent the remainder of her days. She died at her home in Millbrook, Ontario, Canada in 1888, and is buried beside her husband. 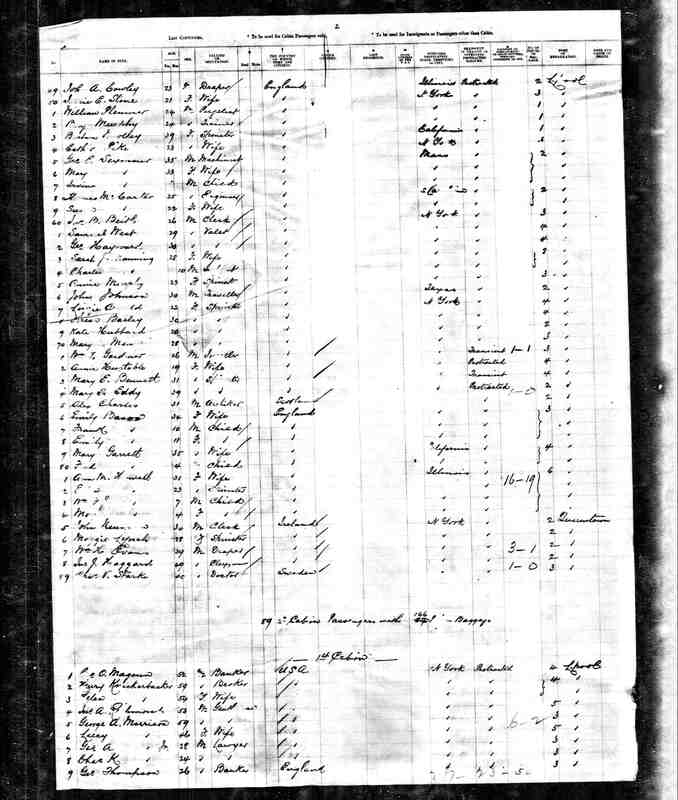 There is no listing of the Abbey family in either the 1850 U. S. Census for Wisconsin or the 1851 Canadian Census, probably due to the timing of their travels. The 1850 U. S. Census taken on August 1, 1850, shows Enos Corey (age 50) born in Pennsylvania with Real Estate worth $500 is a farmer living in Williamstown Township, Dodge Co., WI. Living with him is his wife Elexxx Corey (age 45) born in New York. Also living there are: Lucey Corey (age 14) born in New York; Sophrenia Corey (age 12) born in Pennsylvania; Warner Corey (age 10) born in Pennsylvania; Eleonora Corey (age 8) born in Pennsylvania; Adelia Corey (age 6) born in Pennsylvania; and Alice Corey (age 3) and Alfred Corey (age 3) are twins born in Wisconsin. Other Corey families lived nearby. William Thomas Garrett was born January, 1857, in Kirk Andreas, Isle of Man. Margaret Anne "Maggie" Kneale was born February 12, 1857, in Kirk Andreas, Isle of Man. Christened February 15, 1857, at Andreas, St. Jude's, Isle of Man. The 1860 U. S. Census taken on June 8, 1860, shows Enos Corey (age 60) born in Pennsylvania with Real Estate worth $2,000 and Personal Estate worth $300 is a farmer living in Williamstown Township, Dodge Co., WI. Living with him is his wife Electa Corey (age 55) born in New York. Also living there are: Lucey Corey (age 23) a teacher born in New York; Warner Corey (age 20) a farm laborer born in Pennsylvania; Elenora Corey (age 18) a domestic worker born in Pennsylvania; Adalia Corey (age 16) born in Pennsylvania; Alice Corey (age 13) and Alfred Corey (age 13) are twins born in Wisconsin; and Ira Corey (age 9) born in Wisconsin. Numerous Corey families lived nearby. Electa (Wilcox) Corey died April 15, 1862, in Williamstown Twp., Dodge Co., WI, at age 56. 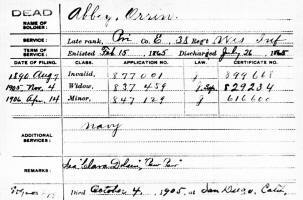 Orrin Abner Abbey enlisted November 6, 1863, in Chicago, Cook Co., IL, as a Seaman in the naval service for a term of one year. Age 18 years, born in Port Hope, Canada, and a citizen of Wisconsin. Occupation is Farmer, Hazel eyes, Dark Brown hair, Dark complexion, and 5 feet and 4 inches tall. He has scars on his right arm, a scar on his left forearm, and has been vaccinated. Orrin Abner Abbey Navy Enlistment Record. Orrin Abner Abbey enlisted in the naval service November 6, 1863, and served as a seaman on the gunboat, Paw Paw, on the Ohio and Tennessee rivers for a year, when he was discharged by reason of expiration of term of enlistment. On February 15, 1865, Orrin was living in Byron Twp., Fond du Lac Co., WI, when he next enlisted in the War of the Rebellion (Civil War) in Company E., 38th Regiment Infantry, Wisconsin Volunteers. He was mustered out and honorably discharged at the end of the war on July 26, 1865, in Washington, DC, by reason of special orders, headquarters department of Washington. Orrin Abner Abbey returned to Byron Twp., Fond du Lac Co., WI, following his army discharge. The 1870 U. S. Census taken on June 6, 1870, shows Wellington Aby (age 29) born in Canada West with real estate worth $4,000 and personal property worth $700 is a Farmer living in Byron Twp., Fond du Lac Co., WI. Living with him is Laura Estelle Aby (age 24) born in New York, who is a House Keeper. Also living there is George Aby (age 1) born in Wisconsin; and Orrin Aby (age 23) born in Canada West, a Farm Laborer. The 1870 U. S. Census taken on August 8, 1870, shows Enos Corey (age 70) born in Pennsylvania with Real Estate of $3,000 and Personal Estate of $700 is a Farmer living in Williamstown Township, Dodge Co., WI. Living with him are Lucey Corey (age 35) born in New York with Personal Estate of $700, who is Keeping House; and Delle Corey (age 24) born in New York, who is at home. They are part of the James Hart household. Also in the dwelling were Martin Hart and his family. The 1870 U. S. Census taken on September 5, 1870, shows Alvin Dodge (age 34) born in Ohio with real estate of 2,400 and personal property of $1,000 is a Farmer, and is living in the Town of Roscoe, Winnebago Co., IL. Living with him are: Elizabeth Dodge (age 30) born in New York, a House Keeper; Emma Dodge (age 10) born in Illinois; Melanethon Chester (age 28) born in New York, a Clerk in a Store; and Chloe Butterfield (age 22) born in Illinois. J. H. Fleisher in 1870 homesteaded the land which Orrin Abbey eventually bought in Republic Co., KA. On August 28, 1871, Orrin Abner Abbey, a single man, entered and paid his fee for Land Patent Application for 160 Acres of land in the NW Qtr., Section 8, Town. 7N, Range 5W, State of Nebraska. Orrin Abner Abbey began developing his land claim, and then returned to Wisconsin to marry Adella "Della" Corey. Orrin Abner Abbey and Adella "Delle" Corey were married February 22, 1872, in Dodge Co., WI. Orrin Abner Abbey and Adella "Delle" Corey then set up their household in Clay Co., NE. 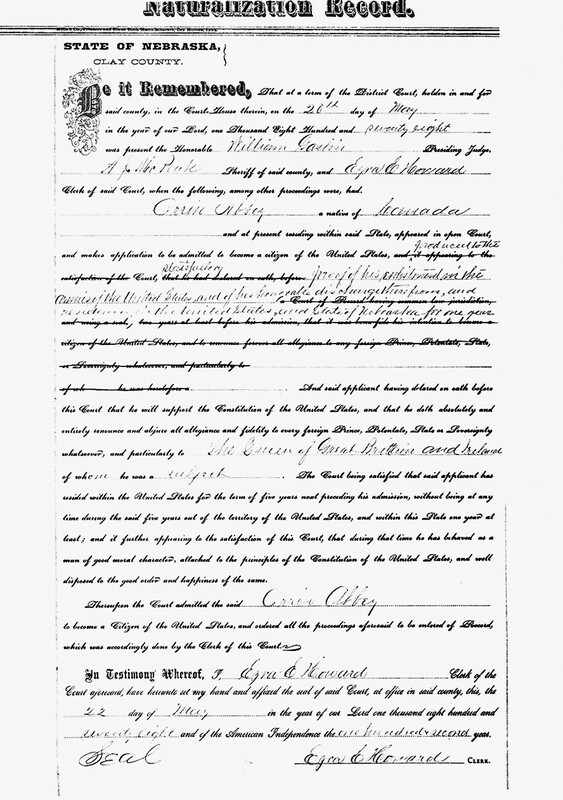 In 1878, Orrin Abbey Petitioned for citizenship in Clay Co., NE. BOOK I - PETITION, Canada, Page 404. 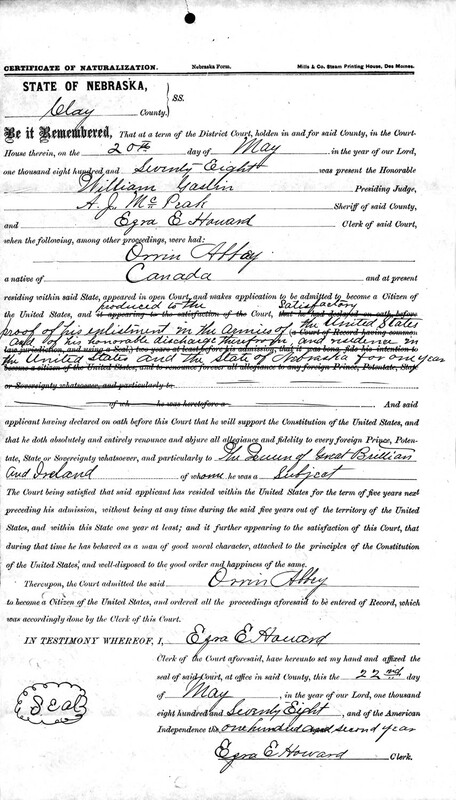 Orrin Abbey became a Naturalized Citizen of the United States on May 22, 1878, at the County Courthouse, Clay Co., NE. The 1880 U. S. Census taken on June 8, 1880, shows Orrin Abby (age 35) born in Canada to Canadian-born parents is a Farmer living in Freedom Twp., Republic Co., KS. Living with him is his wife Belle Z. Abby (age 35) born in Pennsylvania to New York-born parents. Leigh Larson note: Della's brother, Ira Corey and wife Mary lived in an adjacent house, and Della's sister, Sophronia Clark and her husband Ransom Clark lived next to the brother. All heads of household were farmers. The 1880 U. S. Census taken on June 9, 1880, shows Anson Titus (age 48) born in New Hampshire to New Hampshire-born parents is a Millwright living in West Blue, Fillmore Co., NE. Living with him is his wife, Lucy Titus (age 45) born in York State to New York-born parents, who is Keeping House. Also living there is his father, Enos Corey (age 80) born in York State to New York-born parents, who is a Farmer. Eunice Adelle Davies was adopted 1880 in Sutton, Clay Co., NE, by Orrin Abner Abbey and Adella "Delle" (Corey) Abbey. The 1885 Kansas State Census shows Orrin Abby (age 40) born in Canada and previously lived in Nebraska is a married Farmer living in Freedom Twp., Republic Co., KS. Living with him are: a married female, Dele Abby (age 40) born in Pennsylvania and previously lived in Nebraska; Mary Abby (age 8) born in Wisconsin and previously lived in Nebraska; and Eunice Abby (age 6) born in Nebraska and previously lived in Nebraska. Orrin's military record shows serving in Co. E, 38th Wis. Infantry. Mr. H. M. Davies, of Byron, Wisconsin, an old friend of Orrin Abbey, of Freedom tp., was in this city with the latter last week. He is looking over the country with a view to locating, and is very much pleased with what he has seen. He has gone farther west, but will probably visit Belleville again before buying land. Leigh Larson note: Eunice Adelle Davies was adopted by Orrin Abbey in 1880. H. M. Davies is possibly related. In 1887 when Orrin Abbey was a stock holder in the Republic County Co-operative Association, a claim against the Association in the amount of $139.65 and costs of $2.10 was served upon him. He took this to court and was found that he did indeed owe that amount "ABBEY v. LONG". Frederick Kneale Garrett was born April 4, 1888, in the town of Ramsey, Isle of Man. In 1889, Orrin Abbey was Commander of John Brown Post No. 44, G. A. R., in Republic Co., KS. In the November, 1891, Election for Republic Co., KS, Orrin Abbey (Populist Party) came in second place for the office of Register Of Deeds. The 1891 Isle of Man Census shows William T. Garrett (age 34) born in Kirk Andreas, Isle of Man, is a Farmer living in Ballaugh Civil Parish, Isle of Man. Living with him is his wife, Margaret A. Garrett (age 34) born in Kirk Andreas, Isle of Man. Also living there is his son, Fredrick Garrett (age 3) born in Ramsey, Isle of Man. Also living there is an unmarried General Servant Domestic: Sarah Kneale (age 17) born in Kirk Patrick, Isle of Man. The 1891 Isle of Man Census. Mrs. Abbey received a dispatch on Monday night stating that her brother, A. O. Corey of Sutton, Neb., had died at that place. Mrs. Abby and Mr. Ira Corey, her brother, left on the 10:20 to attend the funeral. Mr. Corey was an old disabled soldier. Mrs. Orrin Abbey lies very low at her home near Belleville. She has been sick for about ten days and her many friends hope for her speedy recovery. Mrs. Orrin Abbey and the little girl are safe in San Diego, California at the present time. They were over five days on the road. Mrs. Abbey writes that she got along nicely and was feeling quite well after her trip. She has three sisters at that place. 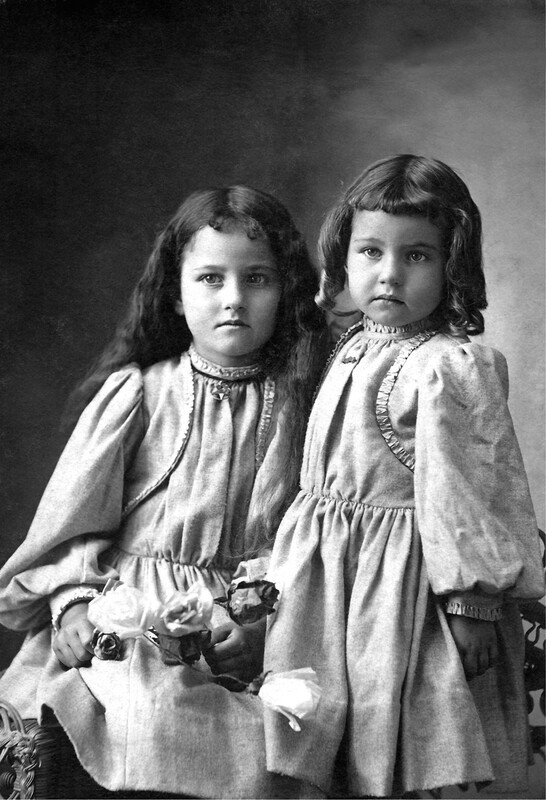 Mary Garrett (age 35) and Fred Garrett (age 4) emigrated from England, departing Liverpool aboard S. S. Umbria, arriving in the Port of New York on October 3, 1892. Their intended destination is California. Orrin Abbey left for California Thursday morning. He took a car load of things with him. Mr. Abbey moved there on account of his wife's health. They were among the oldest settlers in the county and will be missed by their neighbors and friends. We hope the change will be to their advantage all around. Adella "Delle" (Corey) Abbey died November 20, 1892, in San Diego, San Diego Co., CA, at age 47. Buried in La Vista Memorial Park, National City, San Diego Co., CA. 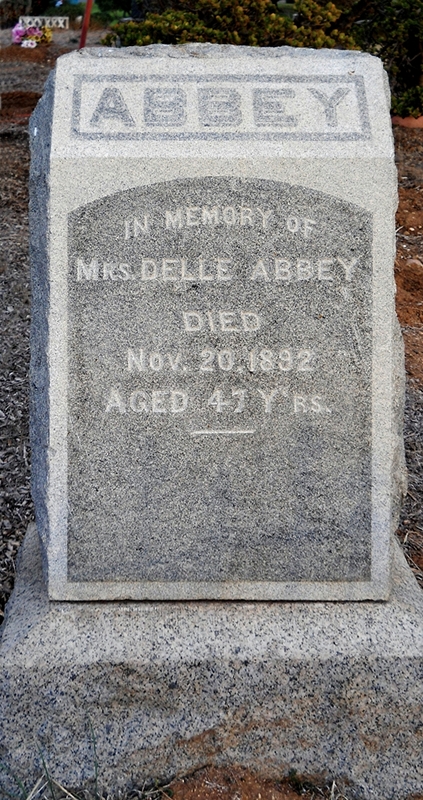 ABBEY - In this city, November 20, 1892, Delle, beloved wife of Orrin Abbey, aged 47 years, a native of Kansas. News was received that Mrs. Orrin Abbey died at San Diego, Cal., of consumption, the day after Mr. Abbeys arrival at that place. Mrs. Abbey went out early in the fall hoping that her health might be benefitted and Mr. Abby rented their place and followed in November. Mrs. Abbey leaves a husband, one daughter and a large circle of friends who lament her loss. We learn that Mrs. Orrin Abbey, who went to California some few months ago with the hope of improving her health, died at San Diego the fore part of last week. Mr. Abbey, who went to join her, arrived only a few hours before she died. Orrin Abbey and Margaret Anne "Maggie" (Kneale) Garrett were married January 25, 1894, at the Central M. E. parsonage, San Diego, San Diego Co., CA. We clip the following from a San Diego, Cal., paper. Married, Jan. 25th, at the Central M. E. parsonage at this city, Mr. Orrin Abbey of Belleville, Kansas to Mrs. Maggie A. Garrett of the Isle of Man. Mr. Abbey is a well known citizen of Republic county and his many friends extend their congratulations to him and his bride. We understand the happy couple will be at home next month. Orin Abbey, of Freedom tp., who has been in California for the past two years, has returned and will again occupy his farm and make his home in the best country on earth. Born, to Mr. and Mrs. Orrin Abbey on Monday Nov. 12th, a daughter, weight 8 lbs. All hands are doing nicely and the little one starts out as a genuine calamity howler. The 1895 Kansas State Census taken on March 1, 1895, shows Orin Abbey (age 48) born in Canada and having moved to Kansas from Nebraska is a Farmer living in Freedom Twp., Republic Co., KS. Living with him are: Maggie Abbey (age 38) born in Isl of Man and having moved to Kansas from California; Eunice Abbey (age 15) born in Nebraska and having moved to Kansas from Nebraska; Fred Abbey (age 7) born in Isl of Man and having moved to Kansas from California; and a male, E. Abbey (age 4 months) born in Kansas. 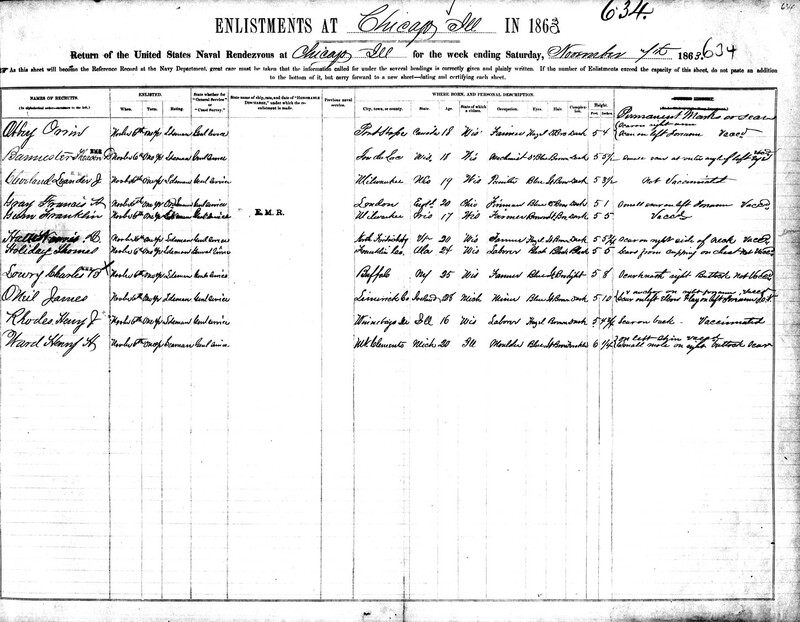 Orin's military record shows serving in Co. E, 38th Wis. Infantry. Mr. Frank Abbey and wife of Superior Neb., came down from that place on Friday and visited his brother Orrin Abbey for two or three days. Born, to Orrin Abbey and wife, of Freedom tp., yesterday forenoon, the 28th, a daughter. Mother and babe both doing nicely. Miss Eunice Abbey left on Friday last for California. She will make her home with an aunt. The 1900 U. S. Census taken on June 19, 1900, shows Orrin Abbey (age 54) born April 1846 in English Canada to English Canadian-born parents and having emigrated in 1852 is a Farmer owning his farm free of a mortgage and living in Freedom Twp., Republic Co., KS. Living with him is his wife of six years, Maggie A. Abbey (age 43) born February 1857 in England to English-born parents and having emigrated in 1892, with all 3 of the children born to her still alive. Also living there are his two daughters, both born in Kansas to English Canadian and English-born parents: Mary E. Abbey (age 5) born November 1894; and Ethyl M. Abbey (age 3) born January 1897. Also living there is his stepson: Fred K. Garrett (age 12) born April 1888 in England to English-born parents and having emigrated in 1892. 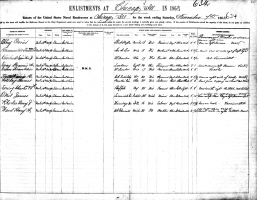 The 1900 U. S. Census taken on June 1, 1900, shows Frank B. Johnson (age 41) born March, 1859, in Illinois to Connecticut-born parents is a Conductor owning his own home with a mortgage and living at 617 Logan Avenue, 9th Ward, City of San Diego, San Diego Co., CA. Living with him is his wife of 16 years, Elta Johnson (age 36) born June, 1863, in Wisconsin to New York-born parents, with 1 of the 2 children born to her still alive. Also living there is his son: Forest Johnson (age 10) born October, 1889, in California to Illinois and Wisconsin-born parents. Also living there is his unmarried cousin: Eunice Abbey (age 20) born June, 1879, in Nebraska to English Canadian and Wisconsin-born parents, a School Teacher. A. Titus and wife, of National City, California, are visiting Orrin Abbey and other relatives in this vicinity this week. Mr. Titus and Mr. Abbey are brothers-in-law. Leigh Larson note: Anson Titus married Lucy M. Corey, a sister of Adella (Corey) Abbey. Mary Abbey cut her face quite badly Tuesday at school by falling on the ice. Orin Abbey went to Topeka last week to have a specialist examine his lungs and comes back much relieved. The specialist told him that his lungs were in excellent condition and the only trouble that he could find was a growth in the throat. He also recommended an operation which Mr. Abbey expects to be performed in the near future. The operation necessary for permanent relief is considered a very delicate one but not especially dangerous. Mr. Abbey certainly has the best wishes of a host of friends in the operation. Orren Abbey presented us on Tuesday with a very large orange from his brother's farm near San Diego, California. Mr. Abbey was in California a few years ago and assisted his brother to set out the trees on which this orange grew. Miss Eunice Abbey recently returned from a visit with her uncle's family. I being generally known that Mr. Orrin Abby, an old and highly respected citizen of Freedom tp., was about to leave for Roswell, New Mexico, where he expects to make his future home, a large number of his neighbors and friends, without warning, paid him a farewell visit on Friday, the 21st. The were fifteen families represented at this gathering all bringing with them baskets well filled with good things to eat such as the housewives of Freedom twp. know so well how to prepare. It was late chore time when the guests reluctantly departed for their several homes with the best wishes of all for the health and prosperity of Mr. Abbey and family but before leaving a committee, consisting of J. F. Walker, G. W. Personette and I. O. Savage was appointed to procure and present to Mr. Abby a testimonial of our regard for him as a neighbor and friend. The committee discharged its duty by presenting to him on Saturday an elegant ten dollar rocking chair, which was a second surprise. The presentation was made by I. O. Savage on behalf of the committee, which was replied to by Mr. Abby in a very feeling manner. 2-17-'05 - Margaret A. Abbey, Orrin Abbey to Thomas Kneale, lots 15, 16, 17, blk 7, Louis' addition; sub-div. of sw qr of nw qr, pueblo lot C; consideration, $10. C. H. Pettyjohn and John Black returned Tuesday from Organ, New Mexico. While away they visited Orrin Abbey and family and report them, all well and nicely located in their new home. A message from Orrin Abbey in New Mexico says that he is very sick. Mr. Abbey has a host of friends here, not only as comrades but with every one. It is their hope that the old comrade may rally and live for many years. Ira Corey received a dispatch on Monday that Orrin Abbey was worse and Mrs. Corey left the next morning to be at his bedside. Orrin A. Abbey died October 4, 1905, in Artesia, Eddy Co., NM, at age 59. See Probate Record at Eddy County Clerks Office in Carlsbad, NM. Belleville, Republic Co., KS, for Last Will & Testament. Ira Corey received a telegram early Thursday morning telling of the death of Orren Abbey at Artesia, New Mexico. Mr. Abbey is well known in Republic county, where he was a resident for a number of years. For some time he has been suffering with throat trouble and went to New Mexico only about a year ago in the hopes of benefitting his health. It is thought that this throat trouble led to a complication of diseases which caused his death. He was a highly respected, well-to-do citizen and the news of his death will come as a shock to his many friends in this vicinity. At the time of going to press it is not known whether his body will be brought here for burial or not. He was a member of the Knights and Ladies of Security at this place. 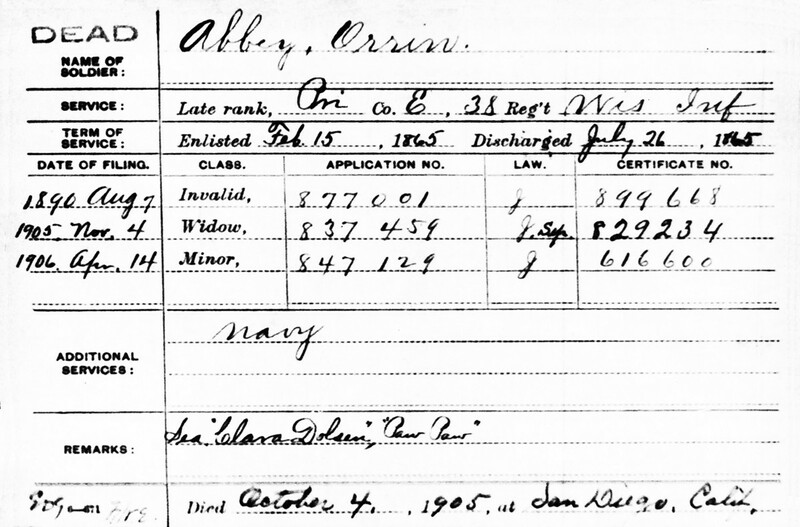 The Civil War Widows Pension Card shows Orrin Abbey died in San Diego, CA. This is incorrect. Whereas Death has removed from our circle our brother, Orrin A. Abbey, and we realize that words at best are of appreciation to the bereaved friends; Therefore, be it Resolved, by Belleville council, No. 87, Knights and Ladies of Security, that we extend to his widow and children deepest sympathy in this their hour of distress and while we realize that our loss is great, it is but slight in comparison to those who have been bereaved of a faithful and loving husband and father, and be it Resolved, that a copy of those resolutions be printed in the city papers, a copy sent to the family and a copy spread on the records of the council. Com. (Mrs. E. M. Wray, H. N. Boyd, Mrs. D. B. Perry). Leigh Larson note: This is perhaps the only record for the middle initial "A" for Orrin Abbey. Maggie Abbey eventually moved to San Diego, CA. Several Corey families had already moved to San Diego. Thomas Kneale and Jeannette Leet were married January 20, 1906, in Oakland, Alameda Co., CA. Thomas Kneale, the well known brick contractor and member of the Masonic fraternity, was married in Oakland Saturday to Miss Jeannette Leet of that city, who has been a resident of San Diego and has many friends here. Rev. Charles F. Brown performed the ceremony in the presence only of immediate friends of the contracting parties. Mr. and Mrs. Kneale will return to this city soon and will be at home at the new residence which Mr. Kneale is erecting on his property west of Mission Cliff, known as Kneale's point. Their many friends here will be sure to extend them a welcome upon their arrival in San Diego. 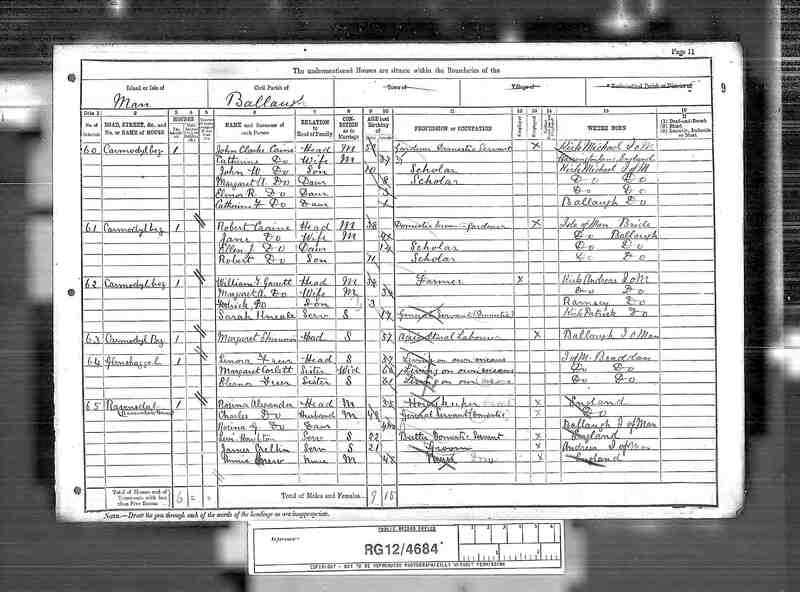 The 1910 U. S. Census taken on April 28, 1910, shows Margaret A. Abbey (age 53) born in England to English-born parents with all 4 of the children born to her still alive is a widowed Head of Household owning her own home free of a mortgage and living at 3924 University Boulevard, 1st Ward, City of San Diego, San Diego Co., CA. Living with her is her five unmarried children: Eunice A. Abbey (age 30) born in Nebraska to English Canadian and English-born parents, who is a Clerk in the Post Office; Fred K. Garrett (age 22) born in England to English Canadian and English-born parents, who is a Home Carpenter; Mary E. Abbey (age 15) born in Kansas to English Canadian and English-born parents; Ethel M. Abbey (age 13) born in Kansas to English Canadian and English-born parents; and Lucy M. Abbey (age 9) born in Kansas to English Canadian and English-born parents. Leigh Larson note: Elta Estella (Unknown, her mother's maiden name was Corey) Johnson was born June 26, 1863 in Wisconsin and died January 31, 1949 in San Diego, San Diego Co., CA at age 85. Frank Bishop Johnson was born March 2, 1859 in Illinois and died May 17, 1942 in San Diego Co., CA at age 83. His mother's maiden name was Warner. 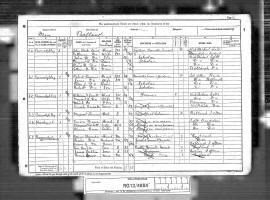 The 1910 U. S. Census taken on April 21, 1910, shows Frank B. Johnson (age 51) born in Illinois to Connecticut-born parents is a Carpenter Working Out and owning his own home with a mortgage and living at 633 Logan Avenue, 9th Ward, City of San Diego, San Diego Co., CA. Living with him is his wife of 25 years, Elta E. Johnson (age 47) born in Wisconsin to New York and Pennsylvania-born parents, with 1 of the 2 children born to her still alive. Also living there is his unmarried son: Forrest C. Johnson (age 20) born in California to Illinois and Wisconsin-born parents, who is a Student. The 1914 San Diego County Voter Registration List dated 1914 shows Mrs. Margaret A. Abbey (Progressive), a Housekeeper, is living at 3924 University Boulevard, San Diego, San Diego Co., CA. The 1916 San Diego County Voter Registration List dated 1916 shows Mrs. Margaret A. Abbey (Democrat), a Housekeeper, is living at 3924 University Boulevard, San Diego, San Diego Co., CA. The WWI Draft Registration Card dated May 29, 1917 shows Fred Kneale Garrett is unmarried and living at 3930 University Blvd., San Diego, CA. The 1918 San Diego County Voter Registration List shows Mrs. Margaret Abbey (Democrat), a Housewife, and Mrs. Mary E. Bunker (Republican), a Seamstress, are living at 3930 Normal, San Diego, San Diego Co., CA. The 1920 U. S. Census taken on January 2, 1920, shows Margret A. Abbey (age 62) born in Isle of Man, England to Isle of Man, England-born parents and having emigrated in 1892 and becoming a Naturalized citizen in 1894 is a head of household widow living at 3930 Normal Street, City of San Diego, San Diego Co., CA. Living with her were: divorced son, Fred K. Garrett (age 31) born in Isle of Man, England to Isle of Man, England-born parents and having emigrated in 1892 and becoming a Naturalized citizen in 1913, who is a Ship Carpenter; and married daughter, Mary E. Bunker (age 25) born in Kansas to Canadian and Isle of Man, England-born parents, who is a Seamstress. Also living there are two grandsons, both born in California to Ohio and Kansas-born parents: Kenneth Bunker (age 7); and Robert O. Bunker (age 4). The 1920 U. S. Census taken on January 9, 1920, shows Eunice A. Ward (age 40) born in Nebraska to United States-born parents and a married Head of Household is a Cannery Packer renting her room at 2330 Union Street, City of San Diego, San Diego Co., CA. The 1920 U. S. Census taken on January 12, 1920, shows Frank B. Johnson (age 60) born in Illinois to Connecticut-born parents is a Proprietor of an Apartment House living at 312 Cedar, City of San Diego, San Diego Co., CA. Living with him is his wife of 25 years, Elta E. Johnson (age 60) born in Wisconsin to New York and Pennsylvania-born parents, who is a Proprietor of an Apartment House. Also living there is her unmarried son: Forrest C. Johnson (age 30) born in California to Illinois and Wisconsin-born parents, who is a Foreman at a Plant. Numerous boarders also live there. The 1922 San Diego County Voter Registration List dated 1922 shows Mrs. Margaret A. Abbey (Democrat), a Housewife, Mrs. Mary E. Bunker (Democrat), a Housewife, Ralph L. Henderson (Republican), a Druggist, and Mrs. L. Myrtle Henderson (Republican) a Housewife, are living at 3937 Cleveland, San Diego, San Diego Co., CA. The 1924 San Diego County Voter Registration List dated 1924 shows Mrs. Margaret A. Abbey (Democrat), a Housewife, is living at 1768 Meade Avenue, San Diego, San Diego Co., CA. JACKS - At Chula Vista, Dec. 7, 1925, Thelma Abbey Jacks, daughter of Mr. and Mrs. John D. Jacks and sister of Douglas Arthur Jacks, all of Chula Vista, and granddaughter of Mrs. Emma Abbey and Mrs. A. N. Towne, both of San Diego; a native of California, aged 2 years 11 months 22 days. Strictly private funeral services will be held at the Benbough funeral parlors, Seventh and Date streets, today (Tuesday), at 2 o'clock p. m. Interment Glen Abbey Memorial park. The 1926 San Diego County Voter Registration List dated 1926 shows Mrs. Margaret A. Abbey (Democrat), a Housewife, is living at 1768 Meade Avenue, San Diego, San Diego Co., CA. Among the successful and important business men of San Diego is Thomas Kneale, brick contractor, who came to the city in 1886. His residence here has, therefore, covered a critical period in the city's development, for San Diego has made rapid growth toward a metropolitan position in the last quarter of a century. Mr. Kneale took advantage of the opportunities which the developing condition afforded him and has ably promoted his interests year by year, becoming not only individually successful but achieving a place of importance as a factor in general expansion. He was born on the Isle of Man, September 22, 1847, an d received his education in his native island, coming to San Diego in 1886. In the early days of the city's building he did some important contracting work and has retained the high place he then acquired in business circles. He put in all the mason work on some of the largest buildings in the city, among which may be mentioned the store operated by George Marston and the McNeece business block. Mr. Kneale married, in 1906, Miss Jeannette Leet, of Oakland, and both are well known and prominent in social circles of the city. Mr. Kneale is a republican and has served on the board of public works. He is also prominent in the Masonic order, having taken the thirty-second degree in that organization. During the many years he has lived in San Diego he has won wide recognition as an able and conscientious business man. His prominence in his line is equalled only by the respect and esteem in which he is held by his many friends, who honor him for the upright and straightforward standards which have marked his activities. Thomas Kneale died July 16, 1927, at his home, 1416 Madison Ave., San Diego, San Diego Co., CA, at age 80. One of Best Known members of Masonic Fraternity; Resident 41 Years. Thomas Kneale, one of San Diego's best known members of the Masonic fraternity, died yesterday at the age of 80 years. Mr. Kneale, who for years served the local Masonic bodies in the responsible office of almoner, distributor of charity funds, had a host of friends throughout the county and his death last night was sad news. He was a Knights Templar, a Shriner and a member of the Scottish Rite body. A native of he Isle of Man, Mr. Kneale came to San Diego 41 years ago and for many years was engaged in the brick contracting business. He is survived by a widow, Jeannette Leet Kneale; two sisters, Jane Cowin of Napa, and Mrs. M. A. Abbey of this city, and a brother, William Kneale of Ocean Beach. The Kneale home is at 1416 Madison avenue. Funeral services will be held Wednesday at 2 p. m. at Brabley and Woolman Funeral Parlors, under auspices of San Diego Masonic lodge No. 296. Cremation will be in Greenwood Memorial park. The 1928 San Diego County Voter Registration List dated 1928 shows Mrs. Margaret A. Abbey (No Party), a Housewife, is living at 1740 Meade Avenue, San Diego, San Diego Co., CA. NAPA, April 17 (P.C.N.S.) - Mrs. Jane Kneale Cowan, 78, and her daughter, Mrs. John Carter, 45, were buried in adjoining graves here today. Despairing because of the illness of her mother, Mrs. Carter leaped to her death from the fourth-story window of a sanitarium here. A few hours later Mrs. Cowan succumbed, unaware of her daughter's death. The 1930 U. S. Census taken on April 8, 1930, shows Margaret Abbey (age 73) born in England to English-born parents, is a widow, and who owns home worth $7,500 is living at 1740 Meade Avenue, San Diego, San Diego Co., CA. She does not own a radio. The 1930 San Diego County Voter Registration List dated 1930 shows Mrs. Margaret A. Abbey (Republican), a Housewife, is living at 1740 Meade Avenue, San Diego, San Diego Co., CA. 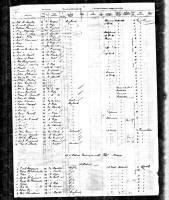 The 1930 U. S. Census taken on April 11, 1930, shows Fred K. Garrett (age 42) born in England to English-born parents and first married at age 32 and having emigrated in 1892 and a Naturalized citizen is a Carpenter for the Gas and Electric Co. who owns his own home valued at $5,500 at 1620 Monroe Street, City of San Diego, San Diego Twp., San Diego Co., CA. Living with him is his wife, Edith B. Garrett (age 41) born in North Dakota to Michigan and Kansas-born parents, and first married at age 32. Also living with him are his two children, both born in California to England and North Dakota-born parents: Phyllis M. Garrett (age 8); and Duane L. Garrett (age 5). The 1930 U. S. Census taken on April 9, 1930, shows Frank B. Johnson (age 71) born in Illinois to Connecticut-born parents and first married at age 25 has no occupation with real estate worth $4,000 is living at 730 Beach Street, City of San Diego, San Diego Co., CA. Living with him is his wife, Elta E. Johnson (age 65) born in Wisconsin to New York and Pennsylvania-born parents and first married at age 20, who has no occupation. Also living there are two lodgers and numerous renters. The 1932 San Diego County Voter Registration List dated 1932 shows Mrs. Margaret A. Abbey (Republican), a Housewife, is living at 1740 Meade Avenue, San Diego, San Diego Co., CA. The 1934 San Diego County Voter Registration List dated 1934 shows Mrs. Margaret A. Abbey (Republican), a Housewife, is living at 1740 Meade Avenue, San Diego, San Diego Co., CA. The 1936 San Diego County Voter Registration List dated 1936 shows Mrs. Margaret A. Abbey (Democrat), a Housewife, is living at 1740 Meade Avenue, San Diego, San Diego Co., CA. The 1940 San Diego County Voter Registration List dated 1940 shows Mrs. Margaret A. Abbey (Democrat), a Housewife, is living at 1740 Meade Avenue, San Diego, San Diego Co., CA. The 1940 U. S. Census taken on April 18, 1940, shows Margaret Abbey (age 83) born in England, and 5 years ago was living in the Same House, and with 8 years of School, and a Naturalized citizen, is a widow who owns her home worth $4,000 and is living at 1740 Meade Avenue, San Diego, San Diego Co., CA. Also living there is a Roomer. The 1942 San Diego County Voter Registration List dated 1942 shows Mrs. Margaret A. Abbey (Democrat), a Housewife, is living at 1740 Meade Avenue, San Diego, San Diego Co., CA. The 1944 San Diego County Voter Registration List dated 1944 shows Mrs. Margaret A. Abbey (Democrat), a Housewife, is living at 1740 Meade Avenue, San Diego, San Diego Co., CA. Funeral services were held here yesterday for Mrs. Jeannette Leet Kneale, 88, member of a prominent Oakland family, who died Saturday at her home, 775 Kingston Avenue. 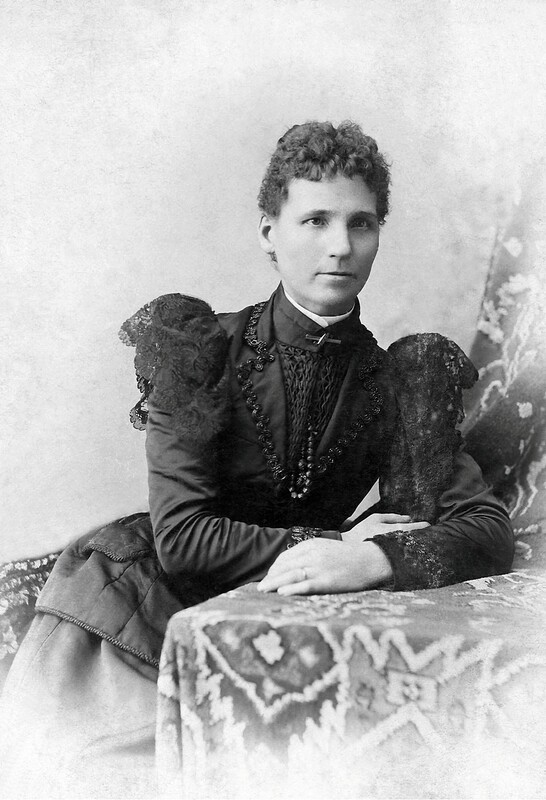 Mrs. Kneale was the daughter of the late Samuel T. Leet, pioneer Californian and State Senator from Placer County in 1860. She was a sister of Robert A. Leet, retired Oakland druggist, former member of the Oakland Port Commission and president of the YMCA here. She is also survived by another brother, Lewis C. Leet, Oakland attorney, and a sister, Mrs. Charles F. Scott, of Pasadena. A native of Placer County, Mrs. Kneale spent most of her youth in Oakland and later moved to San Diego with her husband, the late Thomas Kneale, a building contractor. She returned to Oakland four years ago. Margaret Anne (Kneale) (Garrett) Abbey died February 10, 1947, in San Diego, San Diego Co., CA, at age 89. Buried in Greenwood Memorial Park, San Diego, San Diego Co., CA. Final rites will be conducted at 2 p.m. tomorrow in Park Boulevard Methodist church for Mrs. Margaret Ann Abbey, 89, who first came to San Diego in 1889. The Rev. Roy C. Mason, pastor of Park church, and the Rev. John Gabrielson, former pastor, will officiate, and burial will be in Greenwood Memorial park. Bonham Brother's mortuary is in charge. She died Monday in her home, 1740 Meade ave. Mrs. Abbey, a native of Ramsy, Isle of Man, lived here from 1889 to 1891. She returned later and had lived here continuously for 42 years. She was a charter member of Taylor Methodist church, now the Park church, which was dedicated in 1908. She would have celebrated her 90th birthday yesterday. Surviving are a son, Fred K. Garrett, of San Diego; three daughters, Mrs. Eunice Ward, of Solana Beach, and others in Portland and Santa Monica; five grandsons and two granddaughters and five great-grandchildren. ABBEY -Margaret A., Feb. 10, age 89; mother of Fred K. Garrett, Mary E. Stubbs, Myrtle Henderson and Eunice Ward; seven grandchildren, five great grandchildren. Services Friday, 2 p.m., at the Park Blvd. Methodist church, Polk st. and Park blvd., Rev. Roy C. Mason officiating. Interment Greenwood, Bonham Brothers conducting. Orrin Abbey, of Freedom township, enlisted in the naval service on the seventh day of November, 1864, and served as a seaman on the gunboat, Paw Paw, on the Ohio and Tennessee rivers for a year, when he was discharged by reason of expiration of term of enlistment. Enlisted again as a private on the fifteenth day of February, 1865, in company E, 38th regiment, Wisconsin volunteer infantry, to serve one year or during the war. Was in the battles before Richmond, just prior to Lee's surrender. Was honorably discharged at Washington, D.C., July 26th, 1865, by reason of special orders, headquarters department of Washington. Paw Paw Center-wheel Steamer: tons 175; length 120'; beam 34', draft 3'10"; draft 6'; speed 4 mph. ; a. 2 30-par P.r., 6 24-pdr. how. Fanny, a wooden, center-wheel steamer formerly named St. Charles, was purchased by the Navy at Chicago, III., 9 April 1863 from J. Van Vartwick; arrived Cairo, III. from St. Joseph, Mo. 13 April 1863 for conversion to a "tin-clad" gunboat ; renamed Paw Paw 12 May 1863; designated gunboat No. 31 on 19 June 1863; and commissioned 25 July 1863, Acting Master Augustus F. Thompson in command. Paw Paw patrolled the upper Mississippi protecting Union communication and supply bases from guerilla attacks. She struck a snag and sank in Walnut Bend 6 August 1863, but was pumped out and raised by steam pump boat Champion No. 6. After repairs at Cairo she resumed patrol duty. From 10 October to 13 December, she supported General William T. Sherman's operations on the Tennessee. In acknowledging the arrival of the gunboats, Sherman wrote Porter, "Of course we will get along together elegantly. All I have, he fleet Comdr. S. L. Phelps, the senior naval officer on the Tennessee River can command, and I know the same feeling pervades every sailor's and soldier's heart. We are as one." Sherman's confidence was well founded. The joint effort solidified the Union's position in the South's interior and prepared for Sherman's drive on Atlanta and ultimate thrust to the sea. Through the end of the war, Paw Paw remained active in the Mississippi Squadron maintaining Union control of the vast river system which acted as the nerves and sinews of the South. She decommissioned at Mound City, III. 1 July 1865 and was sold at public auction there to Sol. A. Silver 17 August 1865. Norman B. Carr (ca.1842-1931) served for the Union in the Civil War as chief quartermaster on the naval gunboat U. S. S. Paw Paw during the years 1864-1865. The Paw Paw patrolled the waters of the Mississippi and Ohio Rivers during the war as part of what was known as the "tin-clad navy," vessels made up of converted steamboats that were able to navigate the shallow waters of these rivers. Often overlooked by historians, these vessels were integral in helping to win the war for the Union on the western front. At 22 years of age, Norman Carr left his family in Union Springs, NY and enlisted in the navy on August 12, 1864, opting to serve with the tin-clad navy as opposed to the larger and more celebrated ironclad ships of the Atlantic, where his older brother George was stationed at the time. His family lived on Cayuga Lake in Upstate New York, where his father worked as a lake captain carrying coal and other commodities. From the time Norman enlisted in the navy until his discharge on June 28, 1865, he and his family corresponded quite frequently, each letter giving updated accounts of the details of their daily lives. Although Civil War letters are common, letters written from the western campaign are generally scarcer than those from where the main concentration of conflict took place. Norman Carr’s experiences during the war were not as combative as that of others, but he still understood the ugliness and suffering of the war at a time when the Confederacy was beginning to crumble in defeat. His letters provide literate, newsy accounts of life on the Paw Paw and the Mississippi River, where he encountered Rebel soldiers, ragged prisoners, a smallpox outbreak, and a river collision. They also show his reaction to the news of President Lincoln’s assassination. On August 4th, 1886, the Grand Army of the Republic (G.A.R.) held its twentieth annual convention or "encampment" in San Francisco, California. To honor this event, the San Francisco Daily Morning Call of 3 August 1886 printed a special "Grand Army Edition" containing twenty-eight pages rather than the normal four to ten pages. Within these pages are not only contained a brief history of the achievements by the Union Army and Navy forces during Civil War, but also biographical sketches of 748 delegates and officers of the G.A.R. In 1888 Orrin Abbey was the Commander and Adjutant of John Brown Post No. 44, Belleville, Kansas, Department of Kansas, Grand Army of the Republic. In 1889 Orrin Abbey was a retired farmer living in Belleview, KS (see below). Orrin is a son of Nathaniel A. and Mary (Neugent) Abbey. The paternal grandparents of our subject were natives of Dutchess County, N.Y., but shortly after the Revolutionary War removed to Canada, where Nathaniel Abbey was born. The mother of our subject was a native of County Cavan, Ireland, and in early life emigrated to Canada, where she became acquainted with and married Mr. Abbey. Unto them was born a family of seven children, five sons and two daughters. Isaac, the eldest, enlisted in the Union service during the late war, as a member of the 14th Wisconsin Infantry, and with the exception of the battle of Tupelo, participated in every engagement with his regiment until the close of the war. He had escaped death or injury from rebel bullets, but on the 9th of October, 1865, the day on which the regiment was discharged, he died from disease caused by the hardships and exposure incident to army life. His death occurred in Mobile, Ala., and he was laid to rest in the National Cemetery near that city. Wellington, of this sketch, is the second in order of birth. Orin, a retired farmer, now residing in Belleview, Kan., was also a valiant soldier during the late war, having served in the navy for one year, and as a member of the 38th Wisconsin Infantry for two years. Frank, when but fifteen years of age, responded to the country's call for troops, enlisting in the ranks of the 38th Wisconsin Infantry, in which he served two years, and is now residing in Beaver Crossing, Neb. Abner is engaged in farming near Grand Forks, Dak. Elizabeth is now deceased. She had prepared to make a visit to our subject, when she was foully murdered. She was at that time residing near Port Hope, Canada. It was known that she had money in the bank, and the assassin probably supposed that she had some about her person. For three months after her disappearance no clue was found to the mystery, nor could any trace of her be found. At the end of that time the body was one day discovered, sitting erect against a step, and on examination it was found that a bullet had penetrated her heart. Sarah Ann became the wife of John Harris, and they now reside near Sauk Rapids, Minn. The children were all born in Port Hope, Canada. Among the valued and substantial citizens of Fairfield, Clay county, is A. G. Corey, who for many years was prominent in agricultural development of York county. On removing to Fairfield he engaged in the implement business for some time and them received an appointment as postmaster. He received another appointment to the same position by Woodrow Wilson and is still active on the connection. A. G. Corey was born near Janesville, Rock county, Wisconsin, in 1847, a son of Enos and Electo (Wilcox) Corey, both born near Meadville, Pennsylvania, the former in 1800 and the latter in 1803. There were married there and removed to Wisconsin at an early day, where the father bought land and engaged in farming. Mrs. Corey passed away on the farm in 1866 and the death of her husband occurred in 1898 in San Diego, California, where he had gone for a long trip and rest. Nine children were born to that union, five of whom are living: Lucy, the wife of A. A. Titus of California; Alnora, the widow of a Mr. Tidman (Elnora Tidyman, wife of John N. Tidyman), and a resident of Wisconsin; A. G. the subject of this review; and Ira a farmer of Arkansas. The fraternal affiliation of Mr. Corey was with the Masons, of which he was a Knight Templar, and his political allegiance was given to the democratic party. Four of his sons fought in the civil war. In the acquirement of an education A. G. Corey attended schools of Kekoskee, Dodge county, Wisconsin, and after putting his school books aside engaged in farming with his father. At the age of seventeen years he offered his services to the Union army and enlisted in 1865 in the Two Hundred and Forty-fourth Wisconsin Infantry. He was in active service for nine months. At the close of the war he returned to his home in Wisconsin but soon afterwards came to Nebraska and in 1868 located in York county, where he took up a homestead, whereon he resided for nearly twenty years. He then sold his homestead and removed to Fairfield, where for six months he engaged in the implement business. During Cleveland's second administration he was appointed postmaster and was again appointed to that office by Woodrow Wilson. In 1871 occurred the marriage of Mr. Corey and Miss Mary Gilmore, further mention of whose family is made in the sketch of her brother Sebastian Gilmore, to be found in another part of this work. Five children have been born to this union: Clarence, who owns a job printing plant in Omaha; Ethel, the wife of Ed Lewis a traveling man; Vernie, at home; M. L. in Omaha; and A. B., roadmaster at Vancouver, Washington. Since age conferred upon Mr. Corey the right of franchise he has been a staunch supporter of the democratic party, having firm belief in the principles of that party as factors in good government. He was supervisor for five terms in York county and was holding that position at the time the courthouse was built. His religious faith is that of the Christian church and he is a member of the Modern Woodmen. Mr. Corey devotes his entire time and attention to his duties as postmaster and his many admirable traits of character, combined with his public-spirited citizenship, make him a highly esteemed and representative of Fairfield. John N Tidyman enlisted September 14, 1861 at Kekoskie for 3 years service in the Civil War. He entered as a private in Co. B, 10th Wisconsin Infantry. He was promoted to Corporal 10/1/1862 and to Sgt. 4/20/1863. He fought in a number of major battles, reported to be 8. He was at Perryville, KY, Chattanooga, Peach Tree Creek, Dallas, Stone River, and was wounded at Chickamauga, GA. He was in Sherman's army at Atlanta. He was discharged 11/3/1863. After the war he settled at Mayville, Wisconsin where he had a farm implement store with Mr. Abler. They dissolved in 1884. In 1876 he started the first grain elevator, across from the depot in Mayville (part of which still stood in 1991). He was a dealer in lumber, grain, and produce. He was a mason by trade as had been his ancestors. He was the postmaster at Mayville 8/28/1889 to 9/29/1893. They transferred to the larger post office at Waukegan, IL. They lived at "spaulding Corner". He was a member of AF&AM and IOOF lodges. Among the successful and important business men of San Diego is Thomas Kneale, brick contractor, who came to the city in 1886. His residence here has, therefore, covered a critical period in the city's development, for San Diego has made rapid growth toward a metropolitan position in the last quarter of a century. Mr. Kneale took advantage of the opportunities which the developing condition afforded him and has ably promoted his interests year by year, becoming not only individually successful but achieving a place of importance as a factor in general expansion. He was born on the Isle of Man, September 22, 1847, and received his education in his native island, coming to San Diego in 1886. In the early days of the city's building he did some important contracting work and has retained the high place he then acquired in business circles. He put in all the mason work on some of the largest buildings in the city, among which may be mentioned the store operated by George Marston and the McNeece business block. Mr. Kneale married, in 1906, Miss Jeannette Leet, of Oakland, and both are well known and prominent in social circles of the city. Mr. Kneale is a republican and has served on the board of public works. He is also prominent in the Masonic order, having taken the thirty-second degree in that organization. During the many years he has lived in San Diego he has won wide recognition as an able and conscientious business man. His prominence in his line is equalled only by the respect and esteem in which he is held by his many friends, who honor him for the upright and straightforward standards which have marked his activities.